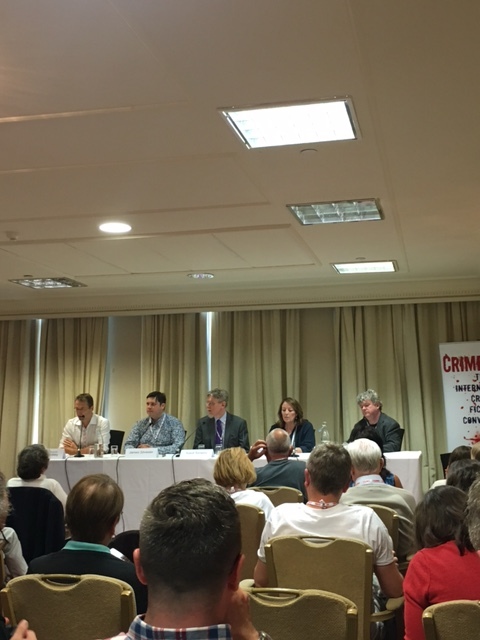 This past weekend I attended my first Crimefest – Crime Fiction Convention (as it’s described on the programme). It’s held in Bristol in the UK and runs from Thursday 19th May to Sunday 22nd May. There are going to be many blog posts online, about this weekend and this is my account of it . Crimefest is held in the Marriott Royal and it is a beautiful hotel with plenty of room for all of the festival goers to roam about in. The festival itself was held over three floors in several rooms. 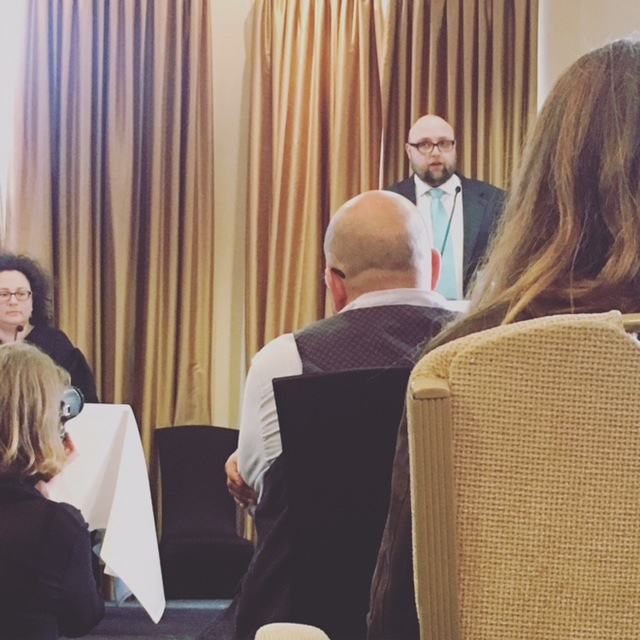 I managed one panel on Thursday afternoon; When Writing About Crime is your Business, with David Jackson, Dolores Gorden-Smith, Sanjida Kay, Thomas Mogford and moderated by Fergus McNeill. 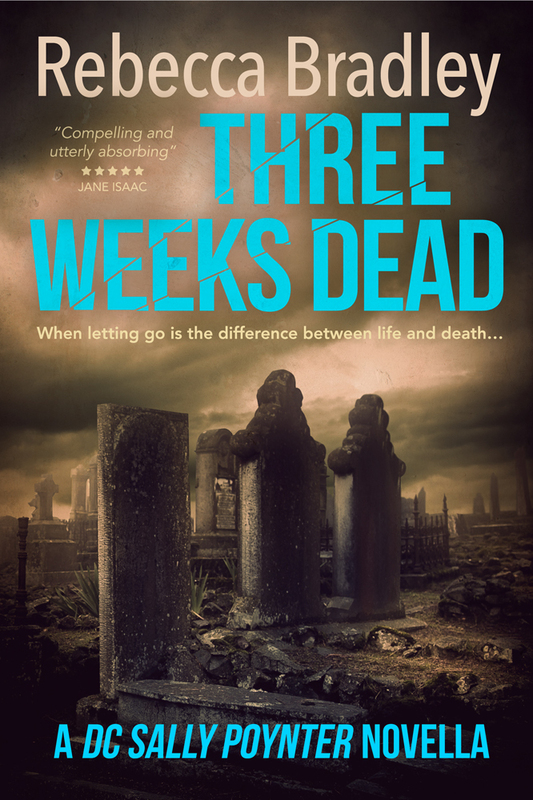 When the authors were asked what drew them to write about dark subject matter, Fergus turned it around and said maybe he should ask the audience what drew them to want to read about dark subject matters. A good question indeed! 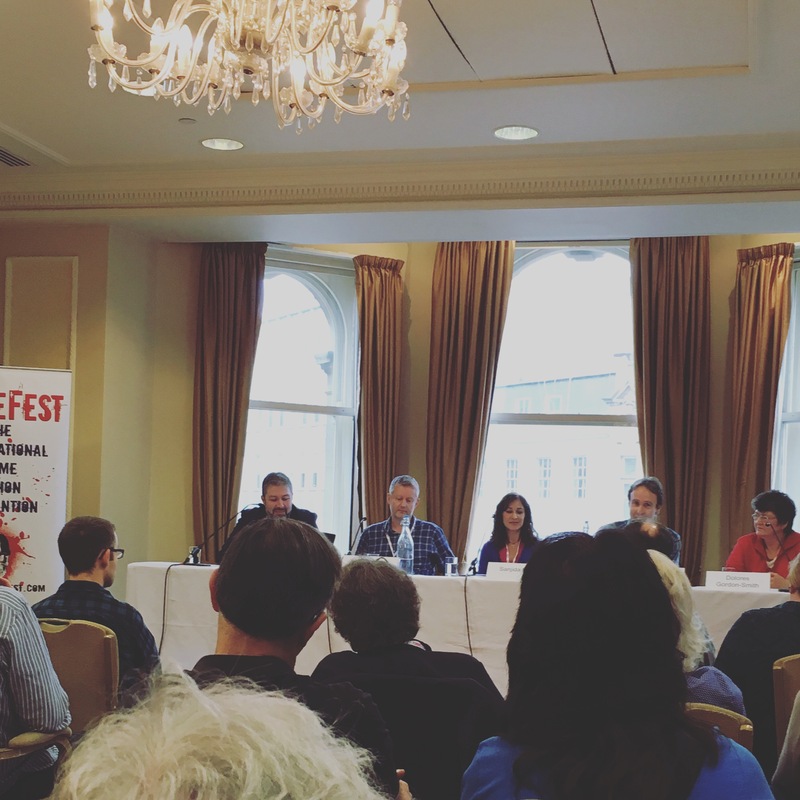 One thing I really like about the Crimefest panels is that because they have either two or three panels running at once – that’s not what I like because you can actually want to go into two but they can be on at the same time and as you know it’s a physical impossibility to be in two places at the same time, unless you’re in some specific kinds of fiction, no, that’s not it – is that because they do have a couple going at once, the panel rooms are quite small so you are closer to the panel, you can see the panellists, see the expressions on their faces as they’re talking. It feels informal and friendly. I really like the feel in the rooms. Friday I went into a couple of great panels. Friday I went into a couple of great panels. 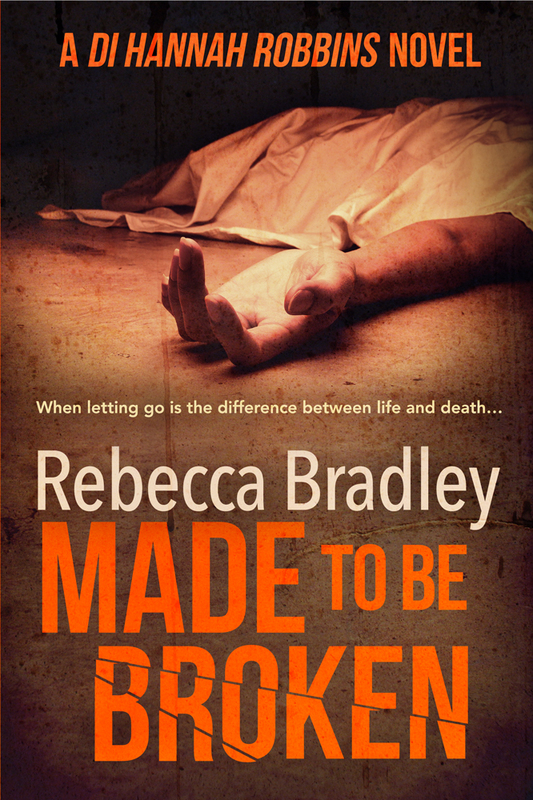 A brilliant 20-minute ‘Spotlight’ by Helen Cadbury on How Crime Fiction Reflects Northern England where apparently it has something to do with her armpit. Then a really interesting panel moderated by Paul Hardisty on Crime Against Humanity with talking authors, Mari Hannah, Yusuf Toropov, Alan Glynn and James Silvester where a very large subject was covered and questions from the audience continued the interesting discussion including whether the lack of finality (when there can be none because there isn’t any in the real world) lets a reader down. 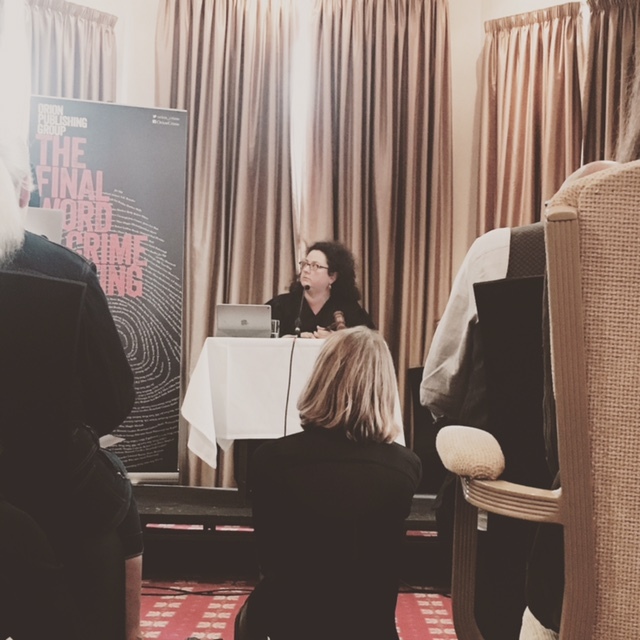 And to end the day a unique festival panel called Making A Murderer where Sophie Hannah was the judge to Neil White’s prosecutor and Steve Cavanagh’s defence (both of whom are crime authors and lawyers!) and the Steven Avery case was played out with a 12 person jury included. Fittingly returning a hung jury! That was my Crimefest weekend. I had a great weekend, but after Friday I was exhausted and in pain and couldn’t attend any panels on Saturday because my body had decided enough was enough and all I could cope with was getting up late and sitting in the lounge in comfort, eating a cream tea, having a drink and having a chat. Then going back to my room. But, regardless of that, I did have a great weekend. Yes, my body holds me back from doing what everyone else is capable of, but I went, I saw, I socialised, I enjoyed and I’m going back. 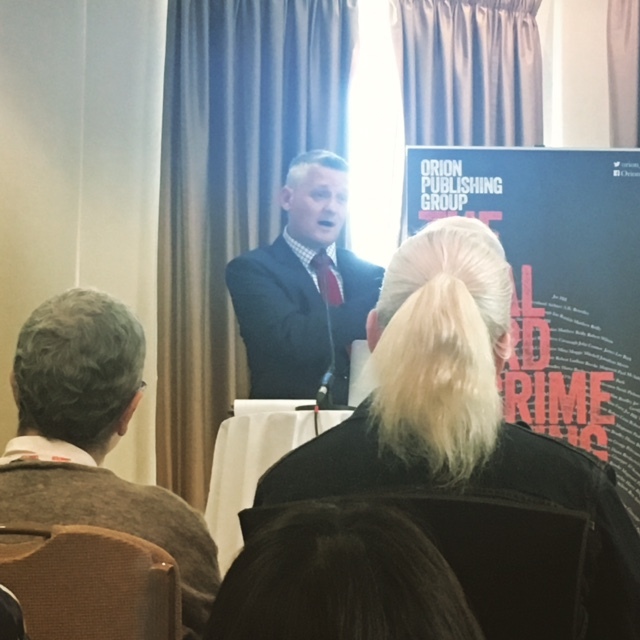 If you love crime fiction or any kind of fiction, I’d highly recommend finding a festival near you and going because people are so friendly simply because you all share the same love. Sounds like a great weekend and the Peter Davidson photo is a classic! I’m so glad you had a such a good experience, Rebecca! Crimefest is definitely an event not to be missed if one can get there! Glad you were feeling well enough to attend and help with the panels. Meeting all of those people was worth it! Great summary. I always want to fly to England and attend these after reading your summary. Lovely. Looks like you had a ball. And Peter Davidson? Legend! I’m glad you had fun! I really need to go to more writer events.